To a relatively small group of wind and kite surfing enthusiasts, Lake Hefner in Oklahoma City is known as the best place in the area to catch a great wave. Thanks to the Independent Filmmakers of Oklahoma and Screaming Butterfly Productions, the lake soon may become well-known throughout the country. Several Enid-area creative artists have their hand in the recently completed documentary titled �Liquid Wind.� From editing the project, to promotions to the music, �Liquid Wind� is very much a creation of Enid talent. Enid High School graduate Diana Kettle had a major role in giving the production its fast-paced, MTV-style look � she�s the editor of the project. She and Tim Eck run Screaming Butterly Productions in Enid, and Kettle has had a lot of success locally editing several projects and music videos. Working with Eck, her work previously was awarded Best Music Video at the Bare Bones International Film Festival, and she was recently named PEGASYS Pro-ducer of the Year for 2003 and Editor of the Year for 2002. Kettle got hooked into the Lake Hefner project by Charles Maupin, an Oklahoma City producer. She met Maupin last summer when she was looking for projects to edit, and he was looking for projects to produce. The OU film school junior and Maupin teamed up to try to capture the essence of the extreme sport of windsurfing and kiteboarding. Extreme is the right word for what goes on out at Lake Hefner. As the promotional trailer to the documentary shows, the wind is aggressive. The lake has been popular with wind surfers, but now kite surfers also have discovered it�s challenges, and they enjoy the highest and most dangerous winds. And, one of the more surprising revelations is that the best wind is actually in the winter months, meaning the surfers endure some extreme weather to practice their sport. According to Maupin and Kettle, the 59-minute documentary aims to show the close-knit, family-type relationship the wind and kite surfers have. What they do is dangerous, and the documentary shows some of that danger. One of the surfers was injured during the filming, and his comrades immediately gathered to help. Maupin said the project was complicated, requiring appointments with city officials and other logistics to clear before filming could take place. They even convinced Oklahoma meteorologist Mike Morgan, of KFOR-TV to be in the film, in which he talks about the uniqueness of the winds at the lake. Filming for the project began last March and concluded in October. After all the filming was done, it�s been up to Kettle to give the project its personality. She went to work editing 300 to 350 hours of raw material. �I contributed to the visual style, not what was being shot, but how fast paced it is,� Kettle said. She also was responsible for the special effects. She also worked with several musicians to create the music for the project. Chris Stevens and Brad Davis have nine songs throughout the documentary. Champagne Studios in Enid produced a special track, �Long Day,� recorded by Jon Carrube with the help of music producer Jerry Patterson. Grey, an Enid rock and pop artist, contributed the track �Joyous Occasion� from his Colours album. Where the production goes from here is anybody�s guess, but Kettle hopes the production goes worldwide. The theater premier will be Jan. 29 at 7:30 p.m. at Meacham Auditorium at the University of Oklahoma. Eck is handling promotion of the film in San Francisco and the California area. �Liquid Wind� also will air on OETA in the spring, and also is lined up to compete in a couple of festivals, including Bare Bones in Muskogee and New York Under-ground. They are are aiming for Cannes and Sun-dance film festivals, and also a festival in Canada. The film will also be distributed to the California library system and will air on television in California, New York and Georgia. As for Kettle, she will continue her education at the University of Oklahoma and hopes a good showing of the �Liquid Wind� project at film festivals might propel her to editing stardom some day. �I want to make films, edit them, edit television shows, like documentaries and music videos,� she said. Maupin thinks the talent is definitely there, and her work on the �Liquid Wind� project shows it. �Diana really excels in her music videos,� he said. �Because she does such a good job of marrying sound with action, for me, she was the only choice� for the project. 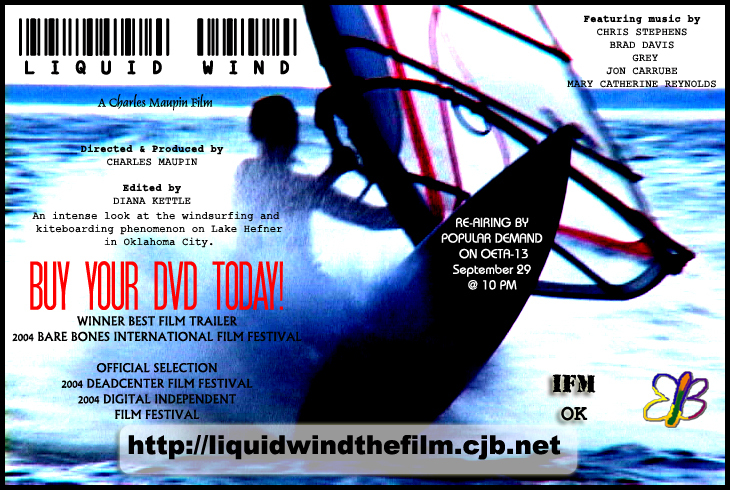 Several Enid area creative artists have a hand in the production of Liquid Wind, a documentary about windsurfers and kiteboarders at Lake Hefner in Oklahoma City. � The project was edited at Screaming Butterfly Productions by Diana Kettle, a 2001 Enid High School graduate and daughter of William and Petra Kettle. She and Tim Eck were honored at the Bare Bones International Film Festival and also as a PEGASYS Producer of the Year for 2003 and Editor of the Year for 2002. � Tim Eck, also of Screaming Butterfly Productions and son of Carol and Arlyn Eck, is in charge of promotion of the film in the California area. � Jon Carrube, Enid, recorded the track �Long Day� for the documentary. The track was recorded by Jerry Patterson and Champagne Studios, also of Enid. An eerie castle, complete with medieval knights and a family-style banquet, was the setting for the 17th annual PEGASYS VideoFest celebration Saturday at Cherokee Strip Conference Center. VideoFest is PEGASYS' own version of the Academy Awards, honoring those who produced original programming from August 1, 2002, through August 1, 2003. The contest featured a record 66 entries in eight categories by 34 different producers . Jason Maly, of Eagle Marketing, served as emcee for the event, which featured several PEGASYS staff, board members and guests dressed in medieval clothing. Entertainment was provided by Jan Hamen and members of Enid Chapter of The Society for Creative Anachronism. Many of the medieval props were furnished by Leonardo's Discovery Warehouse, and Gaslight Theatre provided several of the costumes. "VideoFest is a gift from the Board of Directors and staff to those individuals who make PEGASYS great year after year," said Wendy Quarles, executive director. "It is a celebration of the individual creative spirit. Tonight we recognize those not only in front of the cameras, but also those behind the scenes who script, edit, run cameras, build sets and support their producers. There is so much more to a production than many people realize." Four categories were judged by an access station in Louisiana and another four were judged by a station in Arkansas. Both groups complimented PEGASYS on variety, creativity and the number of entries, said Quarles. 1st place: Tea & Sprockets - Diana Kettle, producer. 2nd place: Mysterious Lab of Dr. Fear: The Mysterious Book - Brian Young, producer. 1st place: Garden Tours of Enid - Phillip Shearer, producer. 2nd place: USBL Champ-ionship Game - Craig Jones, producer. 1st place: Railroad Museum - Craig Jones, producer. 2nd place: Tia Juana - Craig Jones, producer. 1st place: Grey: The Interviews - Diana Kettle, producer. 2nd place: Access Central TV: Bare Bones Film Festival - Tim Eck and Diana Kettle, producers. 1st place: KLVV - Craig Jones, producer. 2nd place: Bible Study - Jerry Holt, producer. 1st place: All Drug Dealers Aren't on the Street PSA - Bill Presley for PreventionWorkz, producer. 1st place: Westlake Kite Festival - Pam Thomason for Juvenile Diabetes Foundation, producer. 1st place: For Your Own Safety: Summer Safety - Bill Presley for Enid Police Department, producer, assisted by Penn Cline. 2nd place: For Your Own Safety: Camping Safety - Bill Presley for Enid Police Department, producer, assisted by Penn Cline. 1st place: Stephanie & the Drive-In Daddies - Gerry-Lynn Fore, producer. 2nd place: Tri-State Field Marching Contest - Gerry-Lynn Fore, producer. Individual achievement awards were also presented in a number of categories. Best Camera Operator: Walter Baker. Best New Volunteer: G. E. Majors, Jim Butricks. 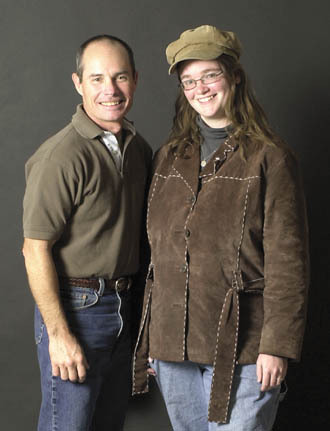 Friend of PEGASYS: Enid News & Eagle; Northwestern Oklahoma State University and Scott Clark, KUAL Radio. Volunteer of the Year: Steve Wilson. Producer of the Year: Diana Kettle. Decade of Achievement: Hugh Hairs. PEGASYS, Enid's public access television station, will honor its best Saturday at VideoFest 2003: A Medieval Flair. The awards ceremony will be in the Cherokee Strip Conference Center. An eerie castle, complete with medieval knights and a family-style banquet, will be the setting for the annual extravaganza. Jason Maly of Eagle Marketing will serve as master of ceremonies, and entertainment will be provided by the Enid chapter of Society of Creative Anachronism. "This night is our gift to the members and volunteers who work all year to make PEGASYS a success," said Wendy Quarles, executive director. "It is all about celebrating the creative spirit and the uniqueness of each programming effort. A record 66 entries in eight categories from 34 different community producers guarantee a festive occasion." The Mysterious Lab of Dr. Fear: "The Mysterious Book" - Brian Young, producer. Reversed No. 2 - Mark Potts, producer. Golden Swingers - Darrell Smith and Dolly Fae Outhier, producers. The Mysterious Lab of Dr. Fear: "The Invasion" - Brian Young, producer. Inspirations with Filese Hauser - Filese Hauser, producer. Grey: The Rock & Pop Sessions, Part 6 - Diana Kettle, producer. The Mysterious Lab of Dr. Fear: "MIB or not To Be" - Brian Young, producer. White Trash Iron Chef - Mark Potts, producer. Reverse No. 1 - Mark Potts, producer. Tea & Sprockets - Diana Kettle, producer. The Closest We'll Get to a Musical - Mark Potts, producer. Acoustic Grey - Diana Kettle, producer. Grey: The Rock & Pop Sessions, Part 5 - Diana Kettle, producer. Grey: The Music Videos - Diana Kettle, producer. The Day of Reckoning No. 6 - Tammy Kennedy, producer. Enid Area Horseshoes - Jerry Holt, producer. Postcard Show No. 83 - Hugh Hairs, producer. Garden Tours of Enid - Phillip Shearer, producer. Waukomis Kindergarten - Craig Jones, producer. NW Oklahoma Custer's March - Phyllis Hammer, producer. USBL Playoffs - Craig Jones, producer. USBL Championship Game: Penn vs. Dodge - Craig Jones, producer. Enid High Great Athletes - Jerry Holt, producer. Medicine on Call - Garfield County Medical Association, producer. Railroad Museum - Craig Jones, producer. Tia Juana - Craig Jones, producer. The Day of Reckoning No. 5 - Tammy Kennedy, producer. A Day in the Life: Road to Zion - Tammy Kennedy, producer. Policemen and Firemen - Mark Potts, producer. Spanish Level 2: Lesson 21 - Roy Adams, producer. Spanish Level 2: Lesson 43 - Roy Adams, producer. Spanish Level 3: Lesson 21 - Roy Adams, producer. Grey: The Interviews - Diana Kettle, producer. Access Central TV: Bare Bones Film Festival - Tim Eck and Diana Kettle, producers. Inspirations with Filese Hauser: Teaching Series Session 2 - Filese Hauser, producer. Spanish Level 1: Lesson 21 - Roy Adams, producer. Heritage Village Tour in French - Nancy Koehn, producer. Thanksgiving in French - Nancy Koehn, producer. Christian Counseling Today No. 119 - Carlan Crawford, producer. Inspirations with Filese Hauser: Winter Songfest - Filese Hauser, producer. Bible Study - Jerry Holt, producer. New Spanish Church - Jerry Holt, producer. The Day of Reckoning No. 7 - Tammy Kennedy, producer. BJ Hall and Dan O' Daniel Interview - Jerry Holt, producer. Out of Sight, Out of Murder PSA - Gaslight Theatre, producer. All Drug Dealers Aren't on the Street PSA - Bill Presley for PreventionWorkz, producer. AMBUCS PSA - AMBUCS of Enid, producer. Media Democracy Week PSA - Julie Baird and Kim Mussman for PEGASYS, producer. Jazz on the Main 2003 PSA - Main Street Enid, producer. Westlake Kite Festival - Pam Thomason for Juvenile Diabetes Foundation, producer. Enid Community Foundation Grants - Enid Community Foundation, producer. YWCA Capital Campaign PSA - YWCA producer. For Your Own Safety: Summer Safety - Bill Presley for EPD, producer. For Your Own Safety: Camping Safety - Bill Presley for EPD, producer. Lift Up Your Eyes - Jack Holt, producer. Thomas Jefferson and the Louisiana Purchase - Gary Gray and Penn Cline, producers. Harvest of Praise - Kim Mussman for World Harvest Church, producer. * The song title is "All the Love in the World" which was one of several videos which all won. The videos were edited at Screaming Butterfly, yet filmed around Enid. ** Grey is an artist, not a band. It is Bare Bones not Barebones. *** There is no film program at NOC. **** The songs featured in the videos were recorded at Champagne Studios and at Filtaire's Cellar in France in the case of "All the Love in the World." It is Grey Havens Studios not GreyHaven. Grey Havens Studios was mentioned during the interview in reference to currently recorded songs that will be in the videos to be filmed this summer which didn't make the article. ***** This is false. Kettle has entered into VIDEO festivals before. She won Best Editor at Pegasys Video Festival, and 2nd place for Grey: The Rock & Pop Sessions Part III in the Entertainment category at the same festival. It is Kettle's first submission into a FILM festival. ****** There were over 30 student entries, not styles. There were at most five styles. May 1st, Northern Oklahoma College Enid: The Red&Silver. Written by Diana Kettle. Edited by Boomer Appleman. The next time a student is struck with immense boredom and a longing for artistic escapism come late April, he or she can escape into the vast landscape of independent films at the Bare Bones International Film Festival. Held recently in Muskogee, this annual seven-day festival has become the largest film festival in Oklahoma. For a price one can see several films produced by college and high school students, low budget filmmakers, and fellow Oklahomans. Festival organizers Shiron and Oscar Ray encourage filmmakers to "shoot in Oklahoma," so naturally there are several Oklahoman filmmakers in competition. However, some filmmakers came from as far away as England, Taiwan and Italy to showcase their work. The festival features several genres of film and video from documentaries to mock-u-mentaries to experimental video. The films encompass such subjects as independent music, racism and inter-planetary warfare. Independent films have a more realistic tone than the glitter and falsehoods of Hollywood. To make up for the lack of expensive effects there is a focus on character development which Hollywood itself sometimes lacks. According to Shiron Ray, film festivals will be the future of movie distribution and exhibition, since independent film is not driven by the box office, but by a love of filmmaking. The crew at Bare Bones have helped to train several actors and filmmakers. They have also been contacted by Warner Brothers for casting calls. One actress went on to act in a film with Angelina Jolie while living in Thailand. Along with viewing several great films, visitors to the film festival were able to participate in the filming of several projects. The most notable are several remakes of the 1903 short film The Great Train Robbery by Edwin S. Porter in honor of the 100-year anniversary of the motion picture industry. Festival attendees are often invited to dress in cowboy gear to participate in these new versions of the first narrative film in film history. A music video and portions of two independent movies were also shot during the festival. The student film fest featured over twenty entries from film students across the country from such schools as UCLA, the University of Oklahoma and even Northern Oklahoma College Enid. Enid Sophomore Diana "Wappy" Kettle contributed a music video show co-produced with Timothy Eck to the student film fest at Bare Bones. Grey: The Music Videos was shown April 24 at the festival and again following the awards ceremony on April 27. In addition, it was the featured film during the filmmaker and media reception at which the Mayor of Muskogee and representatives from the Chamber of Commerce, Muskogee Tourism & Convention and Oklahoma Film Commission spoke. The music of Greg "Grey" Perkins, a former Northern adjunct French instructor, is the focus of the videos that students may have caught a glimpse of as they clicked their remotes past local channel PEGASYS or the now defunct KXOK. The videos are also set to air on television in New York City, Buffalo, Hollywood and Atlanta. "With each new video Tim and Wappy have discovered different and better ways to make them more interesting and closer to what one sees from artists on major labels that have tens of thousands of dollars to spend," says Grey. Wappy, a film and video major, also designed the album art for the majority of Grey�s albums and was recently honored by PEGASYS with the title of Best Editor of 2002. Assisting Grey in production and engineering of his latest work are Dave Skinner of the local acoustic band 3 Legged Monkey and Enid Sophomore Jason Harbour. "I�m learning a lot of useful things about engineering and recording," says Harbour. "Lately, I�ve been working on my own music and doing a lot of home recording. I�ve lots of potential song ideas and they�re starting to finally come together the way I want them to." Harbour, a music composition major, is influenced by the music of Ozzy Osbourne, Dream Theater and Metallica. Harbour played lead guitar on all the Rock & Pop tracks featured in the videos. He was previously lead guitarist for the local band Chaos Moon. Grey has been in several bands in the past before embarking on his solo career including lead guitarist and songwriter for Elixir, a band who once opened for Ritchie Havens at the Myriad. Enid Freshman Mikey Harbour contributed several keyboard and synth string parts to Rock & Pop as well as the percussion for all eleven tracks and continues to do percussion for Grey�s latest material. Enid Sophomore Steve Harwood was also featured on the CD with some elaborate piano solos. According to Grey the new songs will have a more "melody-laden" and complex sound than his previous studio album, Rock & Pop. They expect to release the new album sometime this summer along with new music videos for each track. While in attendance at the festival, Diana Kettle and Tim Eck filmed a one-hour documentary of the events and the people behind the Bare Bones Film Festival. This yet-to-be-named documentary is scheduled to air on New York City�s public access station. Kettle and Eck were also awarded the Bare Bones Grand Jury Award for Best Student Music Video. A "really positive" video interpretation of the music of a local musician will be seen as part of an international film festival in Muskogee this month. "The theme is love is all you really need to have success in life," said Diana Kettle, of Screaming Butterfly Productions in Enid. She filmed the Enid band Grey, led by Greg Perkins, guitarist, bassist, composer and lyricist. Perkins is also an Enid teacher. This is Kettle's first entry into a film festival. The video has been selected for showing in the Bare Bones International Film Festival in Muskogee. The festival will feature a variety films - from science fiction to documentary and student entries, like Kettle's. Kettle is a film student and is presently planning to attend the University of Oklahoma. She eventually would like to be a film editor at a television station, make documentary films or music videos. The program originally showed on PEGASYS in December. "I wanted to show the artistic side of music, rather than people talking- make it interesting to watch, where it would grab your attention," she said. The video features the Enid band Grey, whose music is being recognized in the independent music industry. His song "This is the place, this is the time," ranks No. 4 on Mp3.com, a Web site for independent musicians, where music can be downloaded. Another song, "Addiction," is currently sixth at Shoegazer, a forum for British pop music. Kettle acts as video producer, does the band's website and is the band's promoter. She has owned her video business for two years, and formerly worked for KXOK, a local television station, as a video editor.